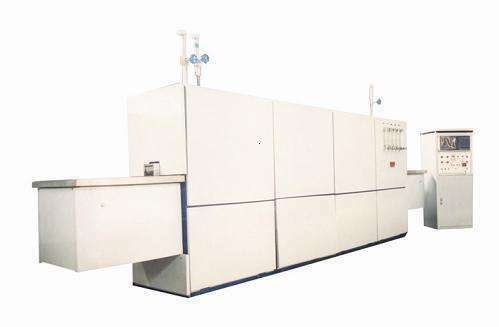 Chain belt sintering furnace chain (belt) type sintering furnace mainly by the heating part, precision temperature control system, mechanical structure, hydrogen nitrogen protection devices and other components. Mainly used in semiconductor devices sintering, sealing, welding and integrated circuit metal shell and other gas-tight packaging, sintering glass containers and various parts under the protection of hydrogen nitrogen heat treatment, carrying capacity, and the use of water, gas Electric converter control sensor alarm and over-temperature alarm function. With hydrogen off alarm and automatic ignition device, and a safety interlock device, is the user to improve production efficiency of the ideal equipment. For semiconductor devices sintering, welding, drying, gas-tight tube package and so on. This device is the atmosphere protection furnace, the protective atmosphere of hydrogen, nitrogen, argon and so on. Equipment has a continuous job, to ensure production efficiency. Unique air curtain with mechanical curtain to ensure that the hearth and air isolation. Multi-temperature control furnace temperature, easy to adjust the process curve. According to user requirements can be equipped with humidifier.